Greenfield is on Highway 101 south of Salinas. While here we visited the Monterey peninsula and Pinnacles National Park. We have been to Monterey before on a road trip and it’s a beautiful place to visit. We checked out the Monterey Bay Coastal Trail, Lovers Point Park, Point Pinos Lightstation and had a terrific lunch in Cannery Row at The Fish Hopper restaurant. We also stopped at the Monarch Butterfly Grove in Pacific Grove. This is one of several wintering sites for these colorful butterflies along the Pacific coast. Temps were in the mid-50’s when we were there so they were not very active and we saw only a couple of them. We’re hoping to see more at the grove in Pismo Beach. 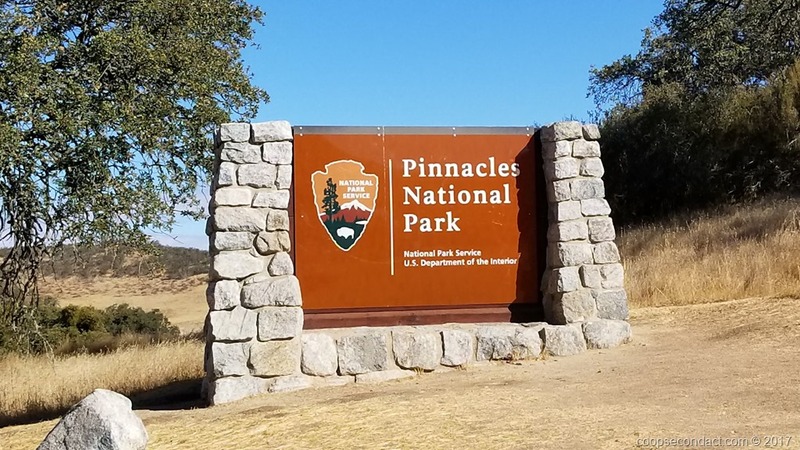 Pinnacles National Park is one of the lesser known national parks, perhaps partly because it was promoted to a national park only 4 years ago. The geology of the park is interesting in that the unique rock formations resulted from a volcano which erupted 23 million years ago. This eruption took place some 200 miles south of the park. How did this happen? The park is on the San Andreas fault and the movement of the Pacific Plate is responsible for the current location. We entered the park’s west entrance for a day hike among the rock pinnacles and spires.